TBA Studios is proud to present the US theatrical release of GOYO: The Boy General (Goyo: Ang Batang Heneral), a film written and directed by Jerrold Tarog. Following its current, successful release in its native Philippines, GOYO will open theatrically in New York on September 21, with Los Angeles and other key US cities to follow. 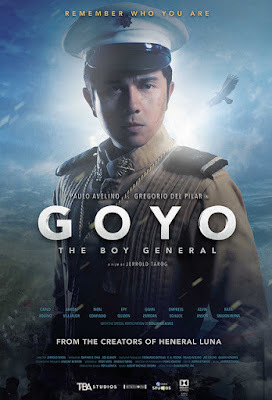 GOYO: The Boy General is a historical biopic that focuses on the last months in the life of Gregorio del Pilar (Paulo Avelino), one of the youngest generals of the Philippine Revolution (against Spain) and the Philippine-American War. He was the most trusted ally of Emilio Aguinaldo, the Philippine President and Commander-in-Chief during the Revolution and War. GOYO is the next installment, following the surprise 2015 blockbuster hit HENERAL LUNA, a film that chronicled Revolutionary General Antonio Luna’s life (and which also had a US theatrical release in October 2015). After five months of relative peace, the U.S. Army begins its final push to crush the Philippine army and capture Aguinaldo. Goyo faces the biggest challenge of his life as he oversees the large caravan of officers, soldiers and civilians making their perilous escape through the mountains of the Northern regions. For many, Gregorio del Pilar was a true hero of the revolution, but for some, he was nothing more than an arrogant henchman of Revolutionary President Emilio Aguinaldo. Yet his willingness to give up his life reveals a level of determination and perhaps humility that cannot be easily dismissed. For someone so young and popular to face death head on, Goyo, as del Pilar is known to his friends, deserves to be examined using both a wider and a more intimate lens. As the second part in the envisioned historical trilogy that began with HENERAL LUNA (2015), GOYO: ANG BATANG HENERAL continues an attempt to examine our faults as a people by using the past as a reflection of the present. With multiple points of view and the same characteristic freedom to move between historical fact and fiction as in HENERAL LUNA, GOYO expounds on themes of maturity and responsibility, contrasts the naivete of youth with sobriety of adulthood, and attempts to ask questions about our readiness for a task of nation building. How does one attain honor when facing certain death? What should a man like Goyo hold close to his heart when forced to make the ultimate sacrifice?